This year I planted Ziar Breadseed poppies. They were easy to grow, made a beautiful display, and now we get to eat them! 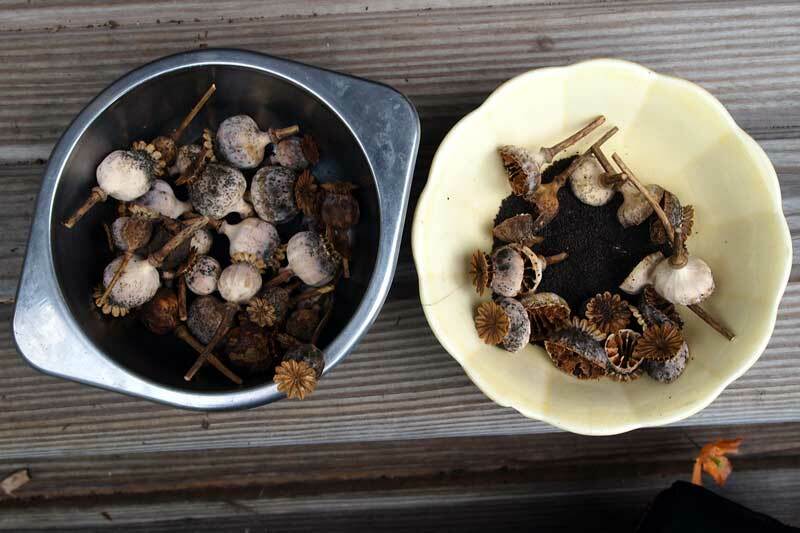 Collecting enough seeds for this recipe was far easier than I thought it would be – each seed head contained several teaspoonsful and this variety is bred to eliminate the vents that would normally drop the seed all over as you picked it. Preheat the oven to 325°F Butter and flour an 8-inch fluted Bundt pan* (I use baking spray). Butter the dull side of a 10-inch piece of foil. Beat the sugar and eggs together in a large bowl. You can go the whole route with a stand mixer and beat for 8 minutes until bright yellow and fluffy, but I never have the time and the cake (while possibly a little bit more dense) is just fine. And delicious. Beat in the lemon zest. Dump the flour and cornstarch over the egg mixture and fold in along with the salt, then mix in the butter and the poppy seeds. Pour the batter into the prepared pan and cover tightly with the buttered foil. Bake for 45 minutes, or until the cake pulls away from the side of the pan and a cake tester inserted in the center of the cake comes out clean. Remove the foil and let the cake cool in the pan on a rack for 15 minutes. When fully cool mix glaze ingredients together and drizzle over cake. *You can also make this into a loaf or layer cake, but it doesn’t make good muffins. I think that’s because it really needs that top layer of foil, and that’s hard to manage with a muffin tin. 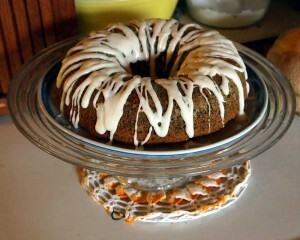 This entry was posted in dessert, family, recipe and tagged cake, harvest, recipe on August 19, 2012 by APo.